The following article is the text of the Brexit speech Professor Sir Anton Muscatelli made on 22 November 2018 at the Scottish Government Brexit Summit for Further and Higher Education. 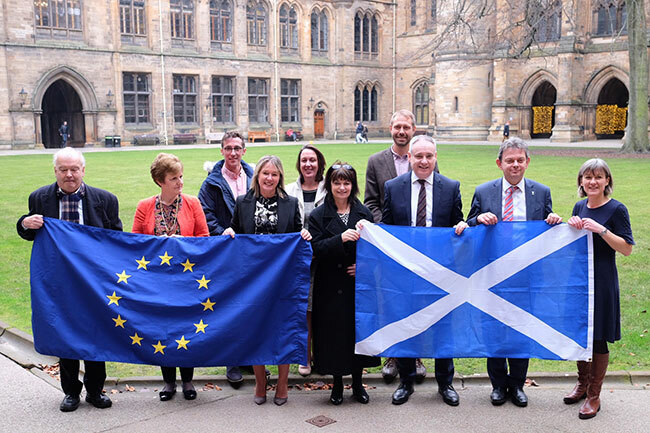 The meeting coincided with the announcement of a joint statement signed by colleges, universities, trades unions and the Scottish Government agreeing a united approach to protect Scottish tertiary education from the worst effects of Brexit. Let me say firstly how pleased I am to welcome you all to the University today for this important occasion – and my particular thanks go to the Minister for bringing this event together, to Professor Rowan for chairing, and to the rest of this morning’s speakers. Nothing has happened in the last few weeks to change that view. Indeed, with the confusion and uncertainty we are seeing every day in Whitehall, if anything my view has only hardened. Most sectors will be hit hard by Brexit – but given the particular circumstances of the further and higher education sectors, the fear is that we will be one of the hardest hit. It should go without saying that European funding through Horizon 2020 has been vital to our universities. Already, we are hearing concerns that the UK has received less from H2020 than it otherwise would due to a downturn in UK participation and less success in winning grants, with many scientists anxious about what will happen after 2021. If you look at the Cordis Horizon 2020 data, and if you take a moving average, the UK’s share of funding has declined from 17.5% in May 2016 to 13% in May 2018. Germany has recently overtaken us in terms of share of funding and France’s share is getting closer. And more than funding, it’s about attracting talent to Scotland. Many of these grants have actually brought European researchers here. Access to networks across Europe are vital – as is ensuring Scotland and the UK can continue to attract talented researchers from across Europe. Unfortunately, we are already seeing the fruits of the Brexiteer’s labours – and more and more young research students are turning away from the U.K.
Russell Group figures show that there was a 9% fall in non-British EU students starting postgraduate research courses in 2017-18 – so a 9% fall in young, talented researchers who want to make the UK the base for what could be their genuinely world-changing work in the years to come. And this is before Brexit has even taken place. This is not just worrying from my perspective as a university leader and an economist – but it is genuinely depressing for those of us who want to see an open and outward looking country. And it is not just about potentially losing much of what we have now – it is about missing out on much of what the future will bring, with less access to European networks and less chance to contribute to the great scientific advances promised in the 21st century. To any academic the opportunity to work across borders to solve the collective social, environmental, economic and scientific problems of our time is deeply exciting. The chance to marshal our collective skills and energies in the fight against poverty, disease and climate change is something that should motivate each of us, no matter our political or constitutional views – offering the chance to be part of something bigger than our own individual interests and petty concerns. If we deny ourselves the chance to participate in that, I believe we will find ourselves diminished in every way. When we face so many grave challenges across the world – tackling inequality, saving our environment, meeting the issues raised in of the age of AI – it would be an act of national negligence to turn our back on these collective endeavours. If I were one of the politicians allowing this to happen, I would find it very difficult to sleep at night. The perfect example of the vital role of EU nationals is my own institution, the University of Glasgow. Over 950 of our staff are non-UK EU nationals – representing 13.2 per cent of our total workforce, and 21% of our academic research staff. We also have over 3,000 EU students studying in Glasgow. These are people who – as well as enriching our campus and the culture of our City – make huge contributions to the ground-breaking research which is a major plank of our economy. From our world-leading work on Precision Medicine to our ground-breaking efforts in Quantum Technology, nanofabrication and FinTech – EU nationals play central roles. These are fields in which Scotland can genuinely lead the world, which could massively boost our economy and which offer innovations that could have truly global impacts. And I know from our industry links that EU nationals work not just for our Universities in these sectors, but for many of the companies that collaborate with us. As skilled technicians, engineers. They are crucial to the NHS. In Scotland, leading the world in innovation and scientific discovery is more than just an aspiration – it’s part of our identity and has been part of our heritage for centuries. A heritage which we are all rightly proud of – and a heritage this generation should not find itself barred from building on simply to satisfy the perverse whims of a handful of Hard Brexiteers, with views more suited to the Dark Ages than the Age of Innovation. Doing so would be nothing less than inter-generational vandalism – and history’s judgement on the politicians who allowed it to happen will be completely unforgiving. That is why the fact that we have all come together today as a tertiary sector is so powerful. To say that we continue to value our relationship with our friends and neighbours in Europe and that we are determined to see them continue to our mutual benefit. In making these points though, as someone as Principal of a world top-100 university – many Brexiteers would see this as making precisely their point for them. That I am a member of an academic or liberal elite, standing in the way of the desires of ordinary people. I want today to address this deceit directly. If there is indeed a gap between the elites and ordinary people on Brexit, it is only this: it is the genuine elites who can afford to ride out the economic catastrophe Brexit will bring, and it is ordinary people will pay the price. Unlike many of the Hard Brexiteers, ordinary working people cannot shift their business interests to Paris. They can’t register their company headquarters in Dublin. They can’t live off inherited wealth or investments. It is ordinary people whose jobs are at risk. Ordinary people whose living standards will be hit. And ordinary people whose hard-worn social and employment rights are now being called into question. All this at the hands of the very same elite who claim to represent them. At various points in history, genuine elites have sought to hide behind a real or imagined popular will to force through repressive measures which will hurt the very people they claim to represent. We now find ourselves in one of those moments – amidst a deceit of historic proportions perpetrated on people right across the U.K.
We have been dragged to the edge of the cliff. But we can still pull back from the brink. The deal presented last week by the Prime Minister appears to be doomed from the beginning – the chances of this passing the Commons are vanishingly slim. But despite the best efforts of the UK Government to present it as the only option between us and the chaos of a No Deal outcome – the fact is, it really is not a situation of deal or no deal. There is not only one alternative to the PM’s deal – there are four alternatives. Alternatives which I have characterised as Mad, Impossible, Plausible and Desirable. The Mad option is the No Deal outcome favoured by Jacob Rees Mogg, Boris Johnson and others in the ERG. It is so appalling that it barely needs to be said. Suffice to say, the economic and social consequences would be so horrific that I don’t think any government could get away with taking this approach. And indeed I think – and I hope – that there is no majority for such a view in the House of Commons. The second route available is the impossible option represented by some on the government and opposition benches, who think there is a better bespoke deal to be negotiated with the EU, but which – amazingly – no one has found yet. I think this impossible option is a cul de sac. There is a smorgasbord of variants, involving tinkering with the Customs Union or, even less likely, by arguing that there is some theoretical position ‘close to but not inside the single market’ or even more recently promising the same benefits as EU membership without being a member. Having spent a lot of time in Brussels in the last 2 years and speaking to experts and EU27 politicians, I can assure you that this is fantasy politics which is, frankly, getting rather tired and simply doesn’t match the gravity of the moment. The Plausible route is the route which the UK government should have taken in the first place – rather than tying itself in knots with the undeliverable red lines of Lancaster House. That is to say, membership of the Single Market and Customs Union. To those who argue that it is impossible to renegotiate the deal at this late stage, actually a soft Brexit along these lines would be relatively simple to negotiate as it mainly involves setting a clear direction of travel in the political declaration, without interfering too much with the Withdrawal Agreement. And I imagine – Indeed I am pretty sure – that this is a move which would be welcomed by the EU27. So this is a ‘plausible’ alternative to the deal negotiated by the Prime Minister – which would limit economic harm as far as it can be while still leaving the EU. But the desirable route is to halt Brexit in its tracks and seek to remain. Even at this late stage it’s clear that in these circumstances the EU27 would be willing to delay the article 50 process. In recent weeks the ‘People’s Vote’ campaign have shown how this outcome could be achieved through parliamentary procedure – and polling evidence is increasingly showing this to be the public’s favoured option. This path would avoid the serious damage to the Higher Education sector, our economy, our society and our place in the world which would come with leaving the EU. Of course it will take leadership from politicians – many of whom have thus far seemed reluctant to stand up to the power, whether real or imagined, of the Hard Brexiteers. But these are not people any serious government should be held to ransom by – a fact that is starting to dawn on people across Westminster. I think the case for acting in the national interest and at least a Single Market option or indeed remaining in the EU itself is there to be made to our politicians and there to be won. Our further and higher education institutions will be crucial to that. This is too important for us to stand on the sidelines. And our mission is clear. To continue to make the case for our positive, inclusive values without fear or favour. Making our voices heard above the din of xenophobia and economic illiteracy which characterised so much of the Hard Brexiteer agenda. The future of our universities, the future of our economy and the future of our status as an open, welcoming, European country are at stake. This is not an argument we can afford to shy away from. It’s not an argument we can afford to lose. It is an argument we have to win. And if our Higher and Further Education sectors – and people across the country with the national interest at heart – come together as we have done today, I am confident we will prevail. The article is the text of the Brexit speech Professor Sir Anton Muscatelli made on 22 November 2018 at the Scottish Government Brexit Summit for Further and Higher Education.